The son of pre-War motor-racing ace Hans Stuck, it was little surprise that he would follow in his esteemed father’s footsteps into the world of motorsport. He’d driven karts and small-capacity BMWs long before he was licensed to drive or even race, and when he was eventually allowed to do so, he started out in hillclimbs. Stuck quickly graduated to the BMW works European Touring Car Championship team, and won the Nurburgring 24 Hours in 1969, and the Spa 24 Hours (partnering Jochen Mass) in 1972. He made the proper switch to single-seater racing in 1973, joining the works March Formula 2 team. 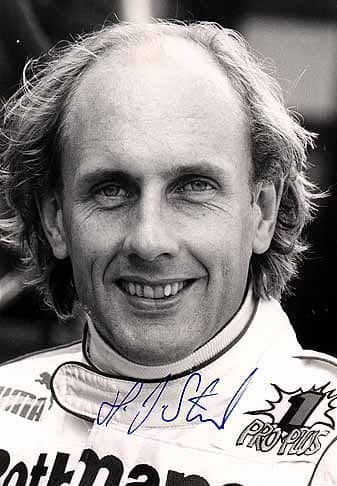 Hans-Joachim Stuck then moved up the ladder with March and made his Grand Prix debut the following year, with his first season proving indicative of the rest of his Grand Prix career: flashes of brilliance one round, and then mired in the midfield at the next. He was initially dropped from the team for 1975, but returned later in the season when the team dropped Lella Lombardi from its line-up, and remained there for 1976 where he again delivered his wild mixture of results. Hans-Joachim Stuck moved to the Brabham Alfa team in 1977 as the replacement for the late Carlos Pace. He twice made the podium, with excellent third places at Germany and Austria. He started from the front row at Watkins Glen, leading in the rain until he slid off into the barriers. His F1 career went downhill from that point onwards. He joined Shadow for 1978 and then had an even tougher year with ATS before he turned his back on F1 and switched focus to an immense schedule of sports, endurance and touring cars. More recently, he’s taken up the role of heading up Volkswagen’s global motorsport presence, and he remains a fascinating and extremely personable character in the pit lane, not least of which for his ability to tell the most unprintable jokes.